Discussion in 'Conspiracy Theories' started by Mick West, Jan 22, 2015. 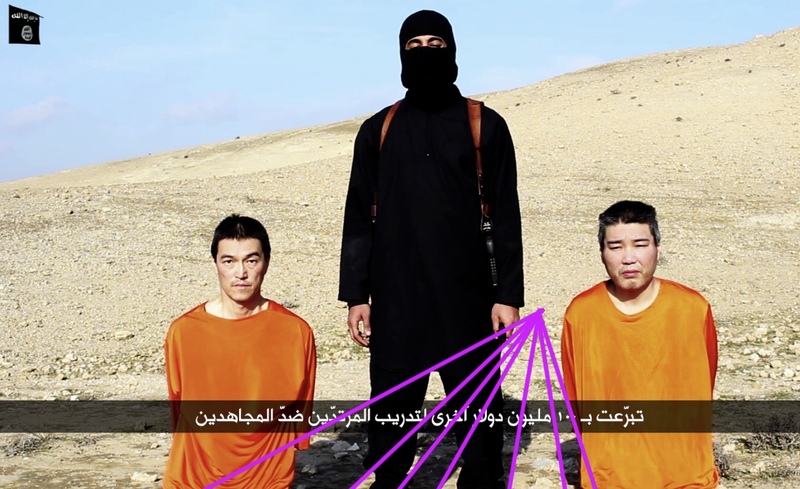 Some people have suggested that the following video of the two Japanese hostages held by ISIS is fake. The main evidence cited for this is shadows, where we can see the shadows on the faces of the hostages look like they are being lit from different sides (note where the shadow falls on the neck and shoulders). The shadows behind the hostages are also claimed to be wrong, with the shadows converging. However, a brief experiment in replicating the video shows this is actually exactly what happens. The video is simply shot with a wide angle lens. 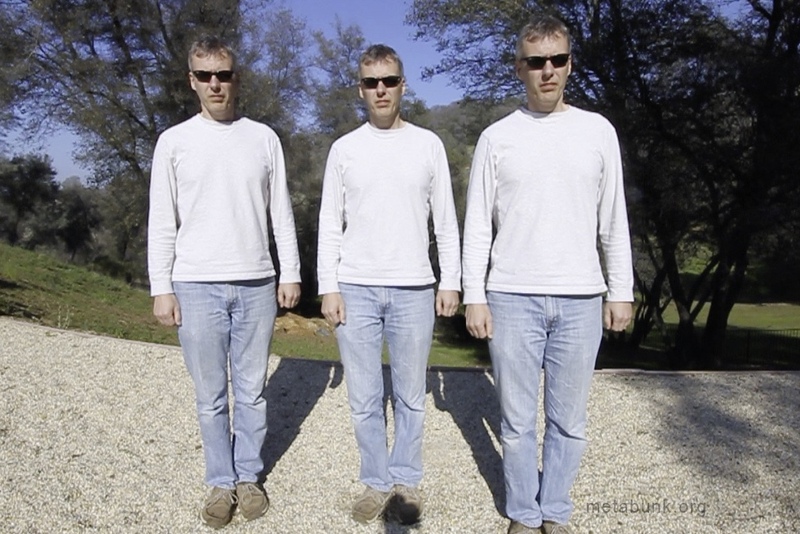 The two hostages are angled slightly in to directly face the camera, which accounts for the face shadows, and shadows behind simply converge because of perspective. 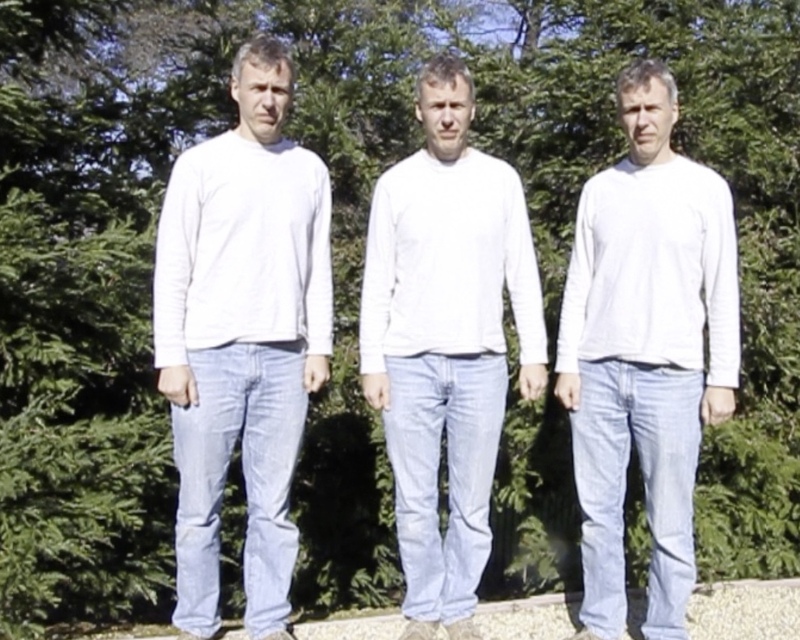 And here's three frames composited from the same video. Notice the shadows on the neck and shoulders look like the light is coming from different directions, when there's only one light source here, the sun. (Note: the ground I am standing on, and on which the shadows are cast, is perfectly flat, this makes the shadows longer than if they were cast on a slope). Reducing it to the simplest level, here's a video of two objects. You can see they cast parallel shadows, but when viewed from the front the shadows converge. There's simply no indication of green screen or video compositing in this particular video. The fact that it's shot from two directions is further evidence that this video is genuine. And in this shot you can tell that the two hostages are looking slightly inwards, as they are looking directly at the camera. This accounts for the neck shadows, as seen above. My setup is not exactly the same as the hostage setup. On flat ground, shadows will all converge at a single vanishing point. In my example, this point is behind the center me. 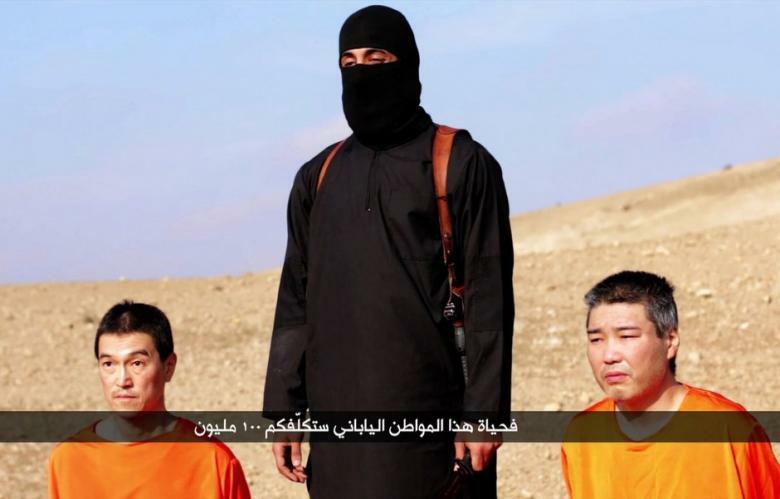 In the hostage photo it's between the Jihadi and the hostage on the right. Infowars attempted to duplicate this video in order to show it could have been faked. However their attempt only illustrates how if the ISIS video is fake, then there's nothing to distinguish it from a real video. There are two obvious differences with the Infowars attempt - there are only faint washed out shadows (because they used multiple lights), and the hostage is not looking at the camera, because he is facing forward. The fact that he's not looking at the camera, and actually seems like he is looking in a totally different direction to the other hostage shows just how little they understand the role of perspective in the shadows. And they didn't even attempt to cast shadows on the ground. Bottom line, since there's nothing to indicate that the video is fake, so the simplest explanation is that it is real. While we can't prove a negative (you can't prove ANY video isn't fake), we can demonstrate there's zero evidence that it's fake, so why are people suggesting it is? At least one video is on YouTube and countless other people are claiming that the "strange" direction of the shadows on the men's faces proves multiple light sources. They also are saying the fuzzy edges around the men prove this has all been done in front of a green screen. Elsewhere on this forum there is a good thread about the moon shadows and how they have repeatedly been misunderstood. I'm wondering if a kind soul here can help me better explain to these people what is actually happening here. If it's real (and the matching background from two angles seems to indicate it is) then I suspect the very high angle of the sun is what is causing problems. If they are facing the sun, and it's very high up, then turning slightly to one side or the other will make the shadow fall on that side. 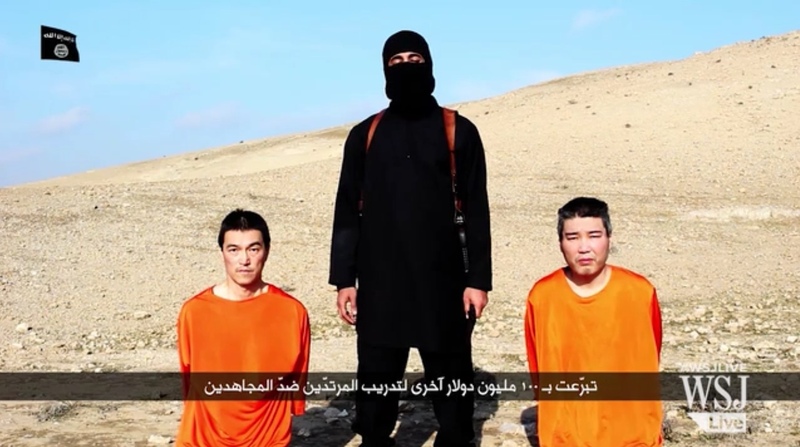 It looks like the 2 hostages may have had video taken at different times and/or places & they've been merged by ISIS - probably for "dramatic effect" - so doctored, but not actually "fake"
I don't think that it's fake, it just looks like it was taken with a rather wide angle, they are facing the sun, but are angled inwards, towards the camera, so the shadows are on the side of the their faces towards the middle. 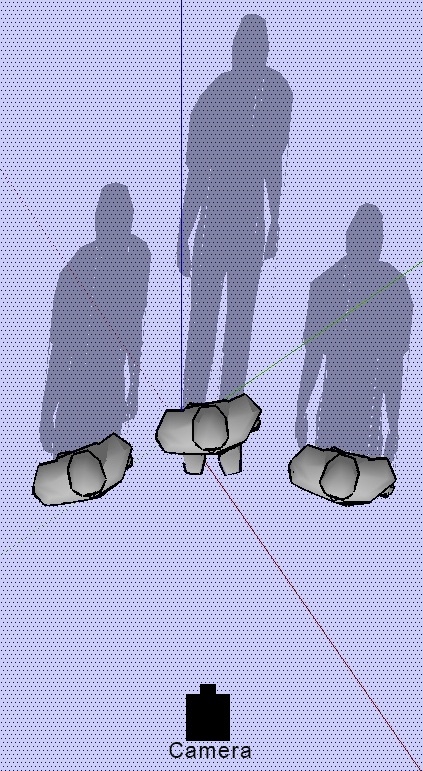 It does seam to my eyes at least that the shadow of the guy on the right of the pic is casting is not pointing in the same direction as the other two figures. But with out knowledge of the exact time, and location the shot was taken at, and with out info on the details of the shoot (ie was there a reflective whiteboard or other light source off camera to the right, what lens was used etc) exactly what causes that odd shadow is anybody's guess. I don't think its doctored, if you look at the video as linked to by Deirdre (linked again here) you'll notice at about 00:38 a gust of wind ripples the clothing on both the hostages and the ISIS guy at the same time so, it looks like the video is real. The fuzzy edges don't look like green screen fuzz to me, just the result of a cheap video / camera phone, or the result of high compression. 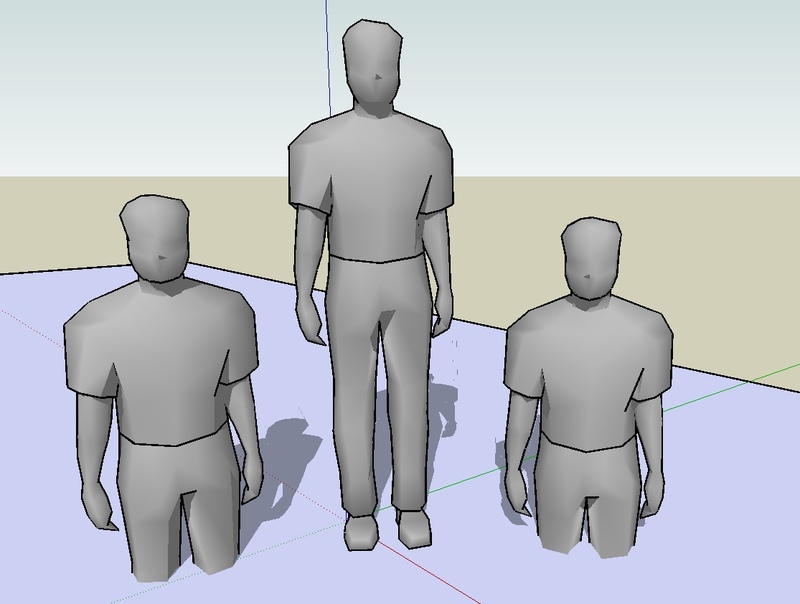 It does seam to my eyes at least that the shadow of the guy on the right of the pic is casting is not pointing in the same direction as the other two figures. Here's a photo showing the same effect. Not having some spare people I used myself in all positions. Notice the shadows on the faces, neck and shoulder, and the shadows on the ground and trees behind seems to be going in different directions. It was shot with a wide angle zoom, about 11.5mm on my 7D, 1.6x multiplier, so equivalent to about 18mm on a 35mm SLR. And here's the same again, on a cleaner piece of ground so you can see the shadows in the background go in "different" directions. In reality they are parallel, and it's just perspective. 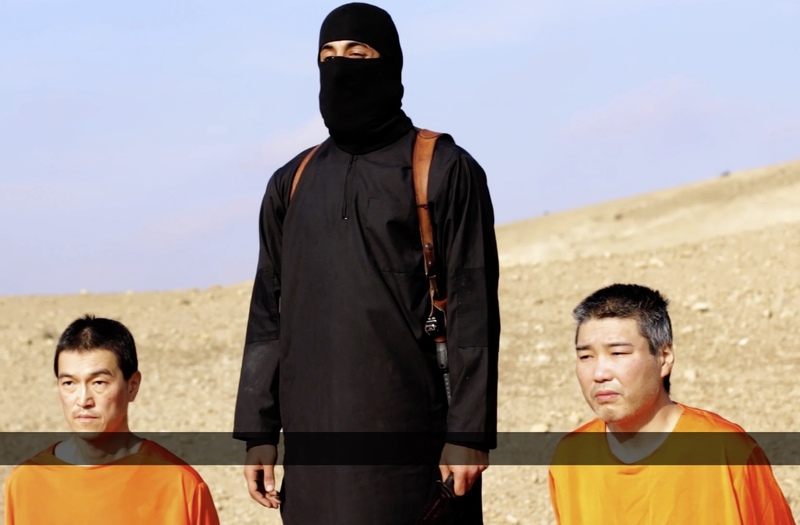 Again here we see the face and neck shadows exactly as in the ISIS video. 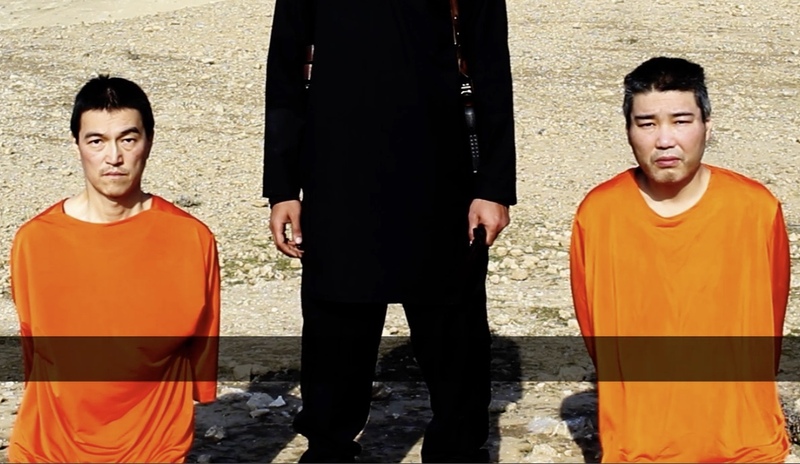 do you have like 3 trees lined up to show why the shadows behind the men look like they angle in towards the terrorist? I think the second photo of me (in sunglasses) does that now. Given the explanation of the shadows, and the matching photos from different angles, I'm going to mark this one as debunked. 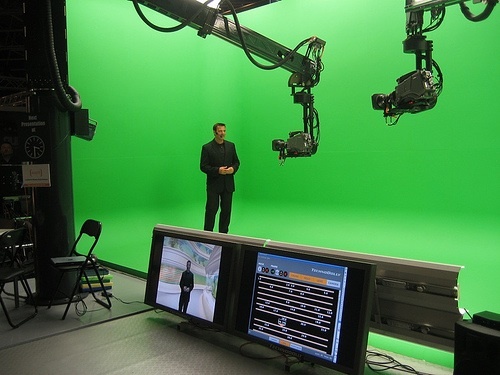 Quick question... Is there a way to check if this is a green screen? I keep looking at the photos and the video and it's got that "Im standing in front of a backdrop" quality to it. This might explain the weird shadows and the other artifacts you guys are seeing... and it would explain why the still photo looks so off. cloning "Wests" to multiply their disinfo efforts to discredit CTs. They had pictures and everything!! What exactly looks "off" about these? It's just the clarity of the sunlit desert. Here's the video from which the above two images are taken. Based on the shadow analysis I see nothing to indicate it is fake. Here's a close up of the shadows, showing the match the clothing flapping in the wind. Green-screen does not leave shadows. i think its like those HD tvs where everything looks too crisp and fake. the whole news footage from Sky News looks green screen to me, everyone in it. not just this desert footage. Im not sure if its the lighting thats throwing it off... or if the camera thats being used is different than what we're accustomed to seeing... For me, a good indicator of green screen are the borders around the actors are usually TOO crisp... As for your motion image.. The shadows may actually be falling on real ground (or on a set) while the green screen is further back to complete the image like this.. so it would explain a bit... and yes I know that sounds far fetched because its a LOT of work to go through for a hoax.. Im not offering it as a hypothesis, Im just trying to wrap my head around what Im seeing vs what the reality of the situation is. On a personal note, itd be nice if it were faked because you wouldnt have two people being murdered (or having their lives threatened) out in the middle of the desert.. so maybe part of it is my just trying to find a reason for it to be faked.. who knows. I've added a summary debunk above the OP. It's just a dull background, brightly lit prisoners, and a high contrast video. Ok cool.. thanks Mick.. couldnt hurt to ask. The top one looks normal, I agree with that, but the bottom pic just has a strange look to it for some reason. It may just be an optical illusion or something, but it also could be the angle the camera is pointing on the second one in comparison to the first one. Their faces look more bright in the second pic.. Looking at it again I can kind of see how it is different that the green screen pic svartbjorn posted. It looks like it is just the lighting. The two views in the video were taken with different cameras, you are going to see different color balances between the two shots. Even with the same model camera, if it is auto-adjusting it can make things look different at different angles, due to lighting. Some segments of the media are picking up the "fake" story, but seemingly just because of the "analysis" of Veryan Khan, a collator of information about terrorism (and not in any way, it seems, an expert on videos). She simply says the shadows seem to converge "unnaturally". But as seen above, it's perfectly normal. Her comments are in the video embedded here. I just thought of something that may be a discussion point in debunking this claim to others out there..If the US government/CIA/NWO/Mossad ect.. wanted to "fake" a video like this, then why would they need a green screen in the first place? 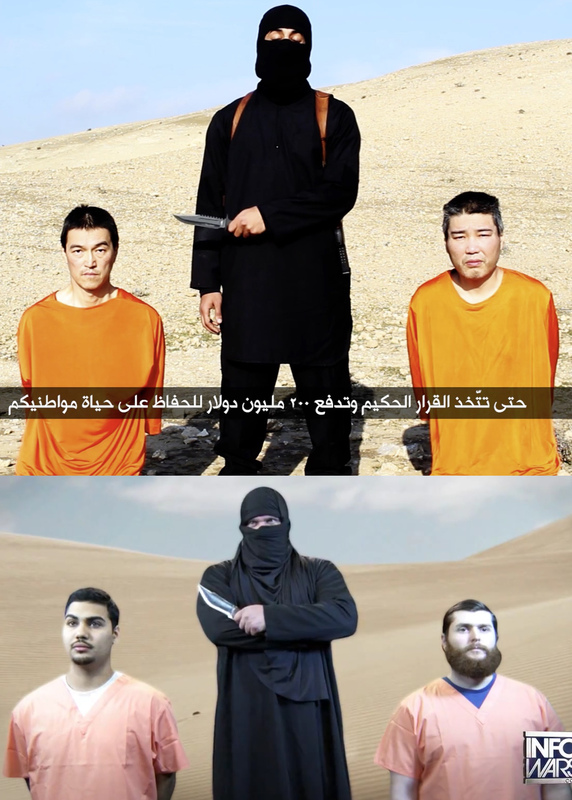 Couldn't they just find a couple of Japanese guys, and a guy to wear a black mask over his face and hold a knife, then go out to the desert somewhere, like Nevada, California Utah ect..and film it there?? 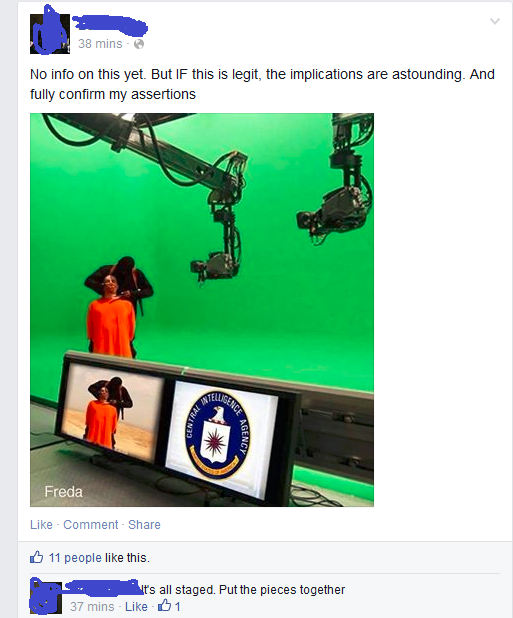 Or if its the Mossad, they are already pretty much in a desert..no need for a green screen there either. There's a range of theories here - the most mainstream is just that the video has been manipulated by ISIS for maximum propaganda. More extreme think the entire think is a fake by the Illuminati NWO types. However the latter use the suspicions of the former as confirmation of their own suspicions. While ISIS certainly seem to be mindful of the impact of their videos, and they do edit them, there's nothing to suggest this isn't what it appears to be. I have a feeling some people may find the bottom of the two (photos above) weird in some way partly due to the colors. The sky feels like it has too much yellow, the desert is more pale than the the usual sand color most westerners are used to, and add to that the garish orange suits and the non-reflective black and it makes for a harsh mixture of colors combining to give the background a feel of a postcard that's been left in the sun and faded somewhat. I think that may just be one of the factors that is prematurely leading some to the "fake" conclusion. The sky feels like it has too much yellow, the desert is more pale than the the usual sand color most westerners are used to, and add to that the garish orange suits and the non-reflective black and it makes for a harsh mixture of colors combine to give the background a feel of a postcard that's been left in the sun and faded somewhat. As it looks like a two camera shoot edited together, one camera dead in front and the other off to one side. If the two cameras (camera phones) were different makes, and / or the guys with the camera hadn't set the white balance your gonna get slight inconsistencies in the colour anyway. For me (having lived for quite a while in several deserts) it has more to do with the look of the individuals themselves more than the backdrop itself. Desert Skies, especially in the Middle East, look exactly like what you see in that picture.. as well as the sand/dirt itself. I think Mick hit the nail on the head (for me) that the Contrast settings for the camera were -really- bad, which caused the weird lighting effect that makes the pictures look faked or touched up.. or its possible that the contrast settings were changed in a program like Photoshop or windows pain etc, which caused the same effect (Id imagine to make identifying of the victims easier). As for the public in general, yes I agree its most likely that they're used to seeing deserts depicted in movies like Sahara or Lawrence of Arabia.. big sweeping dunes of soft sand being blow into the air etc.. and not the baked/blackened hardened earth of Israel, Saudi Arabia and Afghanistan. a sad thread to watch n read, poor souls. It's probably worth to note that some of the impressions in the different shots are caused by their respective depth of field. In the wide angle shot, foreground and background are well focussed, which is not hard to achieve with this optical setting and the brightness of the scenery. However, it flattens the perceived space and makes it harder to imagine a 3D scenery (hence the difficulty to perceive the shadows as aligned). It's also 'not natural' - the human eye is used to shift focus from foreground to background, even in bright light. In the side shot, there was obviously quite a bit of optical zoom involved, and the aperture was set to a small value (large opening). This setting reduces the focused range so that the background is blurred - which is a commonly used effect for dramatization in photography, increasing the perceived space. Both setups are somewhat 'exaggerated', lending a slightly artificial look to the video. However, the only immediate conclusion that can be drawn from this is that the camera operator was eager to get an impressive result, probably to please his superiors. However, the only immediate conclusion that can be drawn from this is that the camera operator was eager to get an impressive result, probably to please his superiors. or.. ,like the rest of us, they cant figure out all these new 'settings' on hd cameras. Doh! More uneducated allegations and declarations make for great click-bait. The original video can be found here, I've replaced the screen captures in the OP with higher resolution versions. I don't even see what the difference is whether they film outside or in a studio, or do the audio track seperately. A hostage threat is a hostage threat. period.